Today I had a taste for something different: Kosher Deli. I remember so well the Maxi City Deli at the old Bradlees shopping center in New City, which, I suppose, I must use as a template for Kosher food. So I opted for the New City Kosher Deli on Main Street. What’s immediately apparent is their wide selection. Before I even arrived, I think I had decided what I wanted. I ordered my predictable seltzer and lemon wedge with an appetizer of one of their famous hot dogs with sauerkraut. It came out right away and was delicious. It was on a soft bun (does anybody make steamed rolls anymore like they used to use with hot dogs?) and loads of sauerkraut, which I smothered in deli mustard. The frank had that welcome “snap” when you bite into it and was so good; I hadn’t had one in a long time. For the main, I ordered the onion rings, which I asked to be crispy. What was different about them was they were in a batter of Italian breadcrumbs, a new spin for me but a good one. I must say they were gigantic too! But the main objective was their pastrami sandwich on rye. It was a very generous stack of pastrami, which I also drowned in their deli mustard. Soon after the hot dog arrived they brought their complimentary traditional plate of kosher pickles and a dish of coleslaw (which had a hint of horseradish, which is how I make it). I made quite a game of switching back and forth between the pickles, slaw and rings with my sandwich. All combinations were terrific. The staff was prompt and courteous and the restaurant was clean and quiet. I was invited to have dessert but was comfortably full and declined. The next time I get a hankering for Kosher deli, this will be the place I go. It came well recommended to me, which is why I went in the first place. The entire meal was a mere $22.16 and was well worth it. 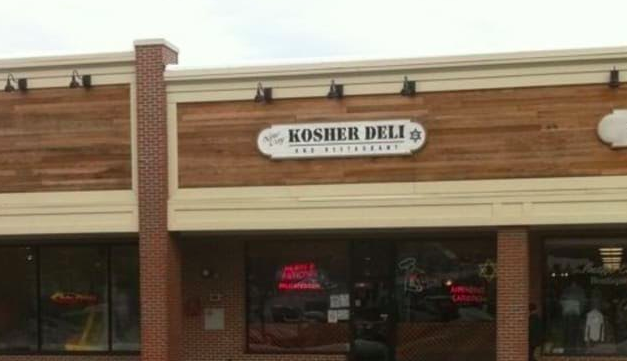 Next time you pass through New City, stop in at the New City Kosher Deli and enjoy.